A comparative analysis of the structural features and tribological properties of multilayer coatings based on refractory metal compounds has been conducted in this review. Features of formation of the electronic structure of the synthesized coatings have been discussed, and the effect of methods and conditions of deposition on changes in the physicomechanical characteristics of nanocrystalline structures based on transition metal nitrides has been shown. 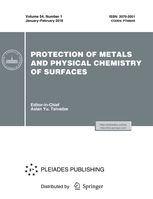 Dependences of antifriction properties, corrosion resistance, and thermal stability on the modulation period (Λ) and the number of bilayers in the studied multilayer coatings have been determined. A decrease in the modulation period of individual layers in a coating positively affects the oxidation resistance of the coating, while an increase in the number of interfaces between the layers slows down the diffusion of oxygen atoms deep into the coating and, thereby, increases the protective properties of the multilayer system as a whole. The effect of the droplet component in cathodic-arc coatings on corrosion development mechanisms in corrosive media has been shown. A class of multifunctional multilayer coatings with an adaptive friction mechanism, which is characterized by a change in the properties and structure during tribological tests, has been discussed separately.